There is something so mysterious yet glamorous about a masquerade ball that makes it a perfect party idea for teenagers that are difficult to plan for. Here I’ll share some masquerade ball dance party ideas that are perfect for both tweens and teenagers. You don’t have to wait until Halloween to plan a fun costumed party! Masquerade Balls have been around since at least the 15th century (you can read more about the history of masquerade balls here on Wikipedia). A masquerade ball is a glamorous event and you’ll want to portray this throughout your party theme. The trick is to do it while not spending a lot of money. Guests can be invited to dress for the ball in dresses or suits (although it isn’t necessary since this can become expensive). You can provide guests with masks upon their entrance to the party. If you are a crafty type of person, you could create a scroll type of invitation in a calligraphy font. 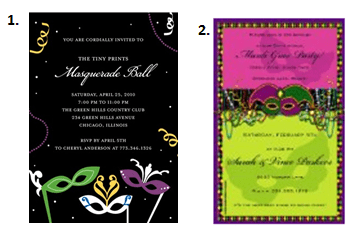 Here are a few other fun ideas for invitations. 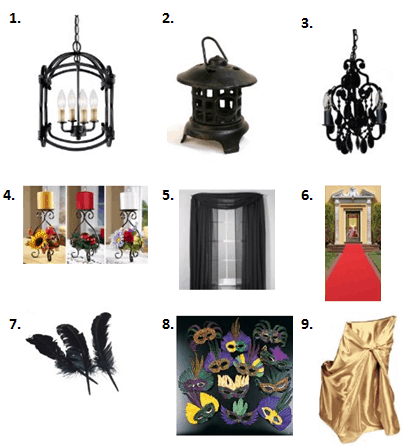 There are many ways you can hep set the scene for a stylish masquerade ball dance party. When thinking about colours, think about dark colours like black, dark red and deep purple. Masks for a masquerade ball are usually decorated with glitter, feathers and sequins so you’ll want to work some of these into your party decor as well. Hosting a fun dance is the perfect activity idea for a masquerade ball. You could have your child help with choosing the selection of music. Simply designate an area for dancing and set up the music for the kids. A dim party area with lanterns sets the scene for a dance party. Ballroom dancing is certainly associated with masquerade parties but how many teens do you know that know how to waltz? For a fun activity idea, you could include these waltz dance steps (from Disney Junior) as a poster on the wall for the kids to try to follow along with. Other than dancing, you could also host a fun mystery for the guests to solve. For some fun & easy mystery clue ideas, check out this party post on mystery party ideas. Fancy hors d’oeuvres are always a hit at parties. Dainty bite-sized treats mean that guests can try a larger variety of party food without their bellies feeling too stuffed. To go along with the glamorous decor, your food could be served on tiered appetizer trays. To drink, you could offer a party punch or sparkling juice in plastic champagne flutes. Garnishing the cups with a strawberry on the rim is a great added touch. For dessert, try serving a cake on a tall cake stand. This can make a beautiful centerpiece for the table. Some fun ideas for treats to send home with the guests include their masquerade masks, feather pens, sequined favor bags filled with candy and sequined coin purses. 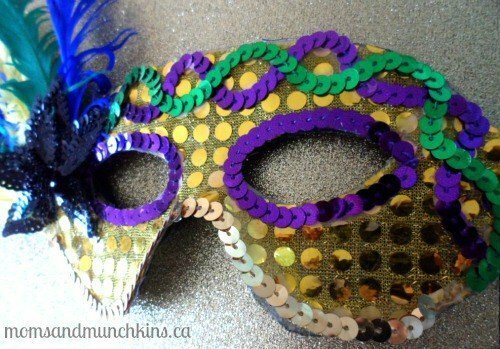 Have you ever attended a masquerade party? We’re always adding fun party ideas for all ages. Never miss an update by joining our communities on Facebook, Twitter, Pinterest and Bloglovin’. Disclosure: I am part of the Tiny Prints Inc. and Amazon affiliate programs. All opinions expressed here are 100% my own. This article is a wonderful resource for anyone looking to plan a successful masquerade ball <3 Thanks so much for sharing!